Crews first used excavators, loaders and dozers to clear out the slide debris, and hauled out 150 truckloads of soil. Then they lined the excavated site with drain rock. Engineers with Oregon's Department of Transportation have come up with a new fix for a pesky problem that has plagued a much-traveled highway since the 1950s. The recent problems on U.S. 20 — a highway 2.5 mi. from Newport that links the central Oregon coast to the I-5 corridor — began in the winter of 2015 after heavy rains triggered a landslide. ODOT spent $100,000 to fix the problem, finishing the work in October 2016. Just one month later, record rainfalls caused the road to slide again. The state has been working on the problem for decades. In the 1960s, ODOT placed a culvert beneath the roadway and was able to keep the slope stable with only ongoing minor repairs — until the recent slides. But this time ODOT engineers looked a little deeper. 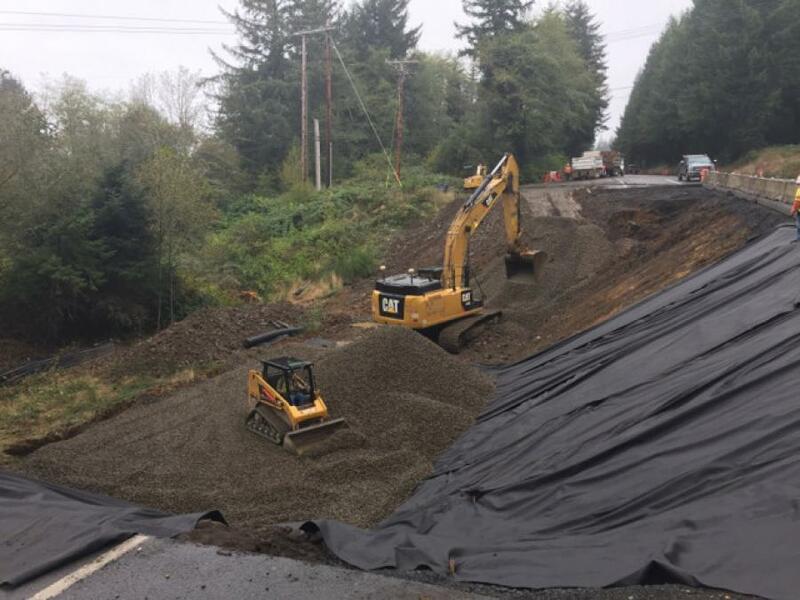 A geotechnical investigation revealed that the original culvert had failed and that the slide area beneath the highway stretched south all the way to Yaquina Bay. With that knowledge, they decided to take a different approach to the repair. This one with a $1 million price tag. And they did that by installing 567 geofoam blocks. Crews first used excavators, loaders and dozers to clear out the slide debris, and hauled out 150 truckloads of soil. Then they lined the excavated site with drain rock. Next, laborers put the blocks – each one 2 ft. tall by 3 ft. wide by 12 ft. long and weighing 130 pounds — in place. Schultz described it as looking like a truss plate. Once the blocks were in place, crews covered them with a gasoline resistant membrane to prevent the foam from melting. After that, the blocks were covered with 4 ft. of crushed rock and paved with asphalt. 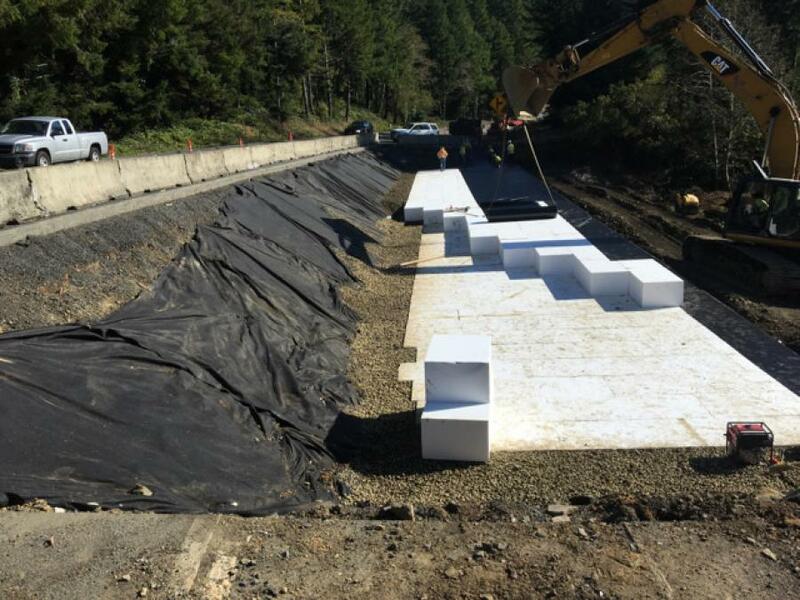 The blocks were one part of a two-prong approach that also included installing a large trench drain just north of the geofoam to divert water away from the slide area. Because the road is narrow, flaggers were used to keep the highway restricted to one lane. When traffic was heavy in both directions, 100 vehicles were released in each direction at a time, acting much like a traffic signal, said ODOT spokeswoman Angela Beers-Seydel. When traffic was heavy in only one direction, 100 vehicles were released from the heavy direction and then the light direction was cleared. ODOT tried different scenarios and found that plan worked best, she said. The project, which began in mid-October, was completed in December.